World Through Violet Colored Lens: Day five and doing well. 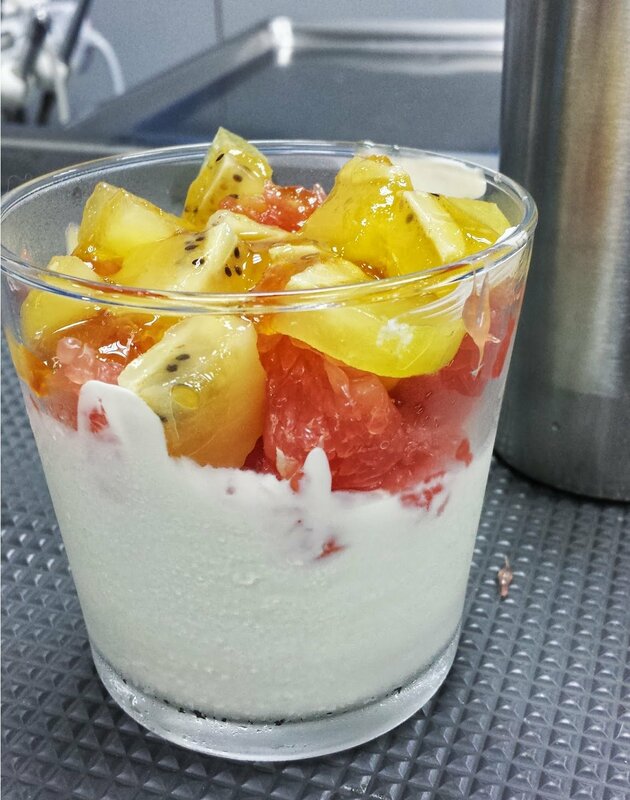 Greek yogurt parfait with grapefruit and kiwi. I added oat bran just before I ate it all. No headache and feeling pretty good after five days. About that headache, I honestly believe my really bad habit of not drinking enough water was the culprit. As I've been consciously trying to remedy that, it seemingly had gone away. I had a couple of small slices of mozzarella pizza for breakfast before I headed out, and then I made myself a milk tea at work that I sipped when I had a moment of free time to catch my breath. Work was particularly busy today and I didn't have time to think about food until four to five hours later. I wasn't even particularly by then. It was something I am starting to notice. I used to get very easily distracted by food at work, and I was almost always hungry even when we were busy. The past couple of days there wasn't that restlessness from being hungry, or the constant craving for food. I consider myself doing pretty good. There is also another thing that I've realized. I think my mother had a slight confusion regarding the definition of vegetarianism. She seems to think that fish is fine with vegetarian. I am not doing this because of moral or philosophical reason, but when I was thinking about vegetarianism I wasn't thinking about 'but fish is okay!' The reason I said that was because she got me a smoked salmon and creamed spinach spaghetti for lunch/dinner along with the mozzarella pizza. When I scooped the salmon off the top and placed them on her plate of squid seafood linguine she looked confused. I explained my reason for doing that and she told me 'but it's just fish!' Well, already cheated yesterday, so not cheating again today. She happily told the extra pieces of fish. And the slightly bit dry spaghetti (what do I expect, it was sitting around for at least four hours before I got to it) with a bit of creamed spinach on top was my lunch. It wasn't a big box, but I was pretty full afterward. Originally, before my mom got home with pizza and pastas, I was going to make myself an egg and cheese sandwich with the little chunk of French bread left, and then a fruit and yogurt parfait at some point, along with roasted broccoli dressed with lemon juice, olive oil, thyme, and Parmesan cheese for dinner. nearly at the end of my shift, I ate the yogurt parfait and didn't have room enough for the broccoli. I started looking for more vegetarian recipe ideas, and some of them looked really good. Kale seems to be in a lot of them, but I've never actually seen them being sold around here. So I'm thinking of using spinach instead. Maybe a mushroom and spinach brown rice bowl? That actually sounds very good. Okay, five days down, two more to go.